Cairns Unlimited- AUSTRALIAN DROP BEARS! The Drop Bear is a large, vicious, carnivorous koala that inhabits treetops and attacks its prey by dropping onto their heads from above. A ficticious creature, the Drop Bear is neverthelss useful for frightening and confusing outsiders, particularly British tourists, who are already terrified of our native wildlife before they even step off the plane. The Drop Bear myth may have developed from a group of extinct animals known as Australian 'megafauna'. These prehistoric creatures included the giant carnivorous rat-kangaroo, the 2.5 tonne 'giant wombat', the 'thunder bird', the 'marsupial wolf', and the 5 metre long giant monitor lizard... not to mention Thylacoleo carnifex, a 100 kilogram carnivorous marsupial. The Thylacoleo is thought to have been an arboreal predator that may well have ambushed prey by dropping on it from overhead branches. It had long retractable claws, large sharp teeth, and a bite as powerful as a 250 kilogram lion. In fact, it had a cat-like skull, but scientists say it was more like a bear than a cat... a giant koala perhaps? 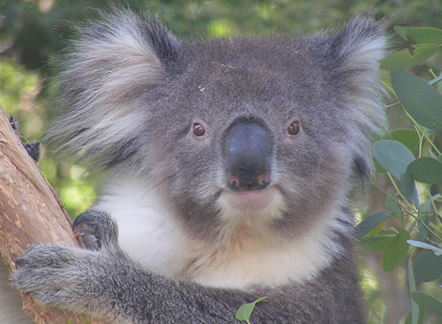 Stories of Drop Bears are often told to unsuspecting foreign visitors, with the helpful suggestion that smearing toothpaste or Vegemite behind the ears will deter the creatures. Such precautions are lent credibility by the fact (a real fact) that Australian magpies can be deterred from attacking by wearing sunglasses on the back of the head. A recent commercial for Bundaberg Rum shows three attractive, young Scandinavian women camping under a tree in the Australian bush. Four Australian men who are camped nearby warn the girls that they shouldn't camp in that spot as they are at risk of being attacked by Drop Bears. The guys return to their tent, laughing, just as "Bundy Bear", the seven-foot tall polar bear mascot for Bundaberg Rum, falls from the tree above. The terrified girls then run into the Australian men's camp. The Thylacoleo carnifex has been extinct for over 50,000 years. If you see one, or a Drop Bear, please email us.